Faster isn’t better if it means you get pummeled to death by gravity. Everyone likes a shortcut and a quick trip somewhere cool, which means that everyone loves a wormhole — at least in theory. In actuality, these space-time tunnels are probably not the alleged intergalactic shortcuts we’re looking for — and this isn’t a mind trick from Obi-Wan, either. 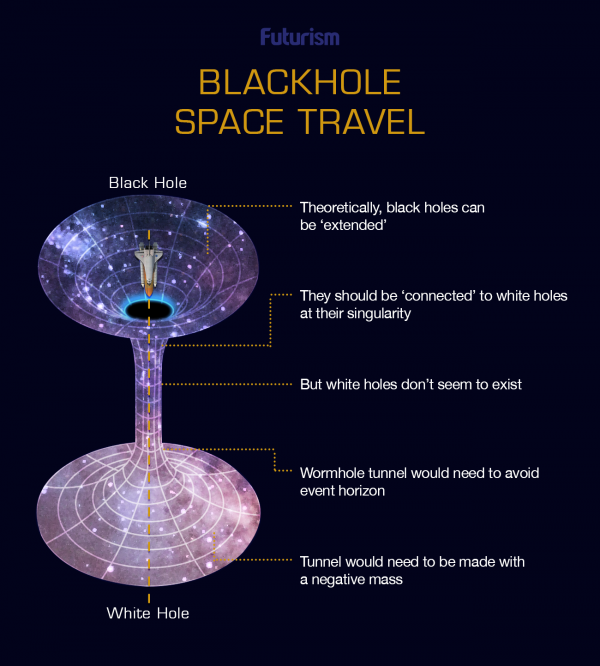 But first, let’s talk about what wormholes are and how they could theoretically allow for faster-than-light travel; it’s always better to build up all of our hopes before dashing them to pieces, I find. When physicists started tinkering with general relativity, they predicted that black holes might exist. The same physics that predicts black holes also predicts white holes, which are just what they sound like: the opposite of black holes. The event horizon of a black hole is a corner of space that is impossible to escape once you’ve entered it. On the other hand, the event horizon of a white hole is impossible to enter — but you can escape if you’re already there. The wormhole comes in when we learn that all black holes are naturally connected to white holes; these identically opposite twins are joined at the singularities. Or so the math says. While we’ve seen black holes a-plenty, there’s no evidence at all for white holes — nor any evidence for any process that could form them, or any means for them to stay in existence if they formed, or even any way they could survive their “symbiotic” connections to black holes. There is just no way they could ever form, or be stable enough to remain once formed. That instability would directly affect any wormholes: they would never be able to last, and would instead stretch and break almost immediately. If you happened to see a wormhole and went for a ride, you’d be on a one way trip into an event horizon of a black hole. That sounds cool, but remember: you’d then be stretched endlessly and pummeled to death by gravity (and even Anthony Perkins thinks that’s crazy). However, some still believe that we can make wormholes work for us, as sort of a next level tube system going all over the universe rather than just beneath London. To make it work, you’d need to enter just outside the event horizon so you could get through the wormhole without getting done in by gravity first. You’d also need a tunnel strong and stable enough to handle both the gravitational pummeling mentioned above, and the force of people flying through it at extreme speeds. What would make that possible? A tunnel made of negative-mass material. Negative-mass materials have not been found in the universe anywhere, although physicists in Washington recently created a fluid with negative-mass. So will they someday create negative-mass material that you could, say, build a tunnel with? Maybe. Will We Ever Find Workable Wormholes? Still, should this really be a priority—? There are plenty of reasons why traveling this quickly would mean a lot to humanity: we could explore far reaches of the galaxy, potentially finding alien life, more habitable planets, and whatever else it has to offer—probably a lot. However, we don’t need to pin all of our hopes on wormholes just because we wish to traverse the galaxy. First of all, even breakthroughs in physics such as the creation of negative-mass materials are unlikely to lead to workable wormholes. These fantastical space travel tunnels would violate numerous laws of physics — many of which are very well-tested. The odds of defeating each and every one of them seem long, indeed. Furthermore, there are a number of other projects in the works that could help us travel faster in space. NASA and others have been studying the EmDrive, a radio frequency resonant cavity thruster that uses microwaves inside a truncated cone to create a thrust at the narrow end of the cone. If it works, it would mean the ability to create thrust without a propellant — a huge advancement for long-distance space travel. This tech is a long way from being viable, however. Ion propulsion is already being used once rockets are already in space. NASA’s Dawn mission uses ion propulsion, as do several other missions from Japan and the ESA. How long it will be before the technology could be used to help humans travel extremely long distances, however, remains to be seen. In short, it seems unlikely that a solution that would require breaking every law in the physics book will be the one that gets us there. As fun as wormholes feel from the outside, they’re probably not worth too much of our focus.